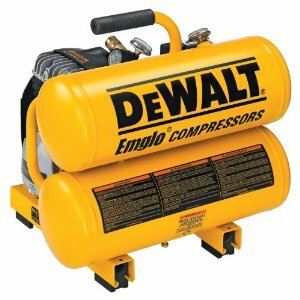 This heavy duty air compressor is the real deal. 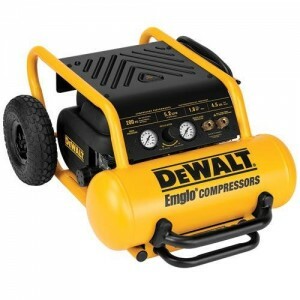 When you need to get work done on the job site or around the house, the DeWalt D55146 compressor is the machine to do it. It is a popular choice for contractors because it is a reasonable price, easy to drag around, and easy to maintain. The DeWalt D55146 weighs almost 85 pounds, so it is not a light weight machine. But, it does come with wheels and carries much like a travel suitcase, with a collapsible handle. It carries in a vertical fashion, but you can rest it horizontally. It has a big roll cage in bright yellow protecting the tank and pump. The tank is 4.5 gallons. The horsepower and PSI number are both pretty strong. The machine maxes out at 200 PSI with a 5.2 SCFM at 90 PSI. The power is unquestionably strong for this air compressor. The tank is easy to empty, too. The machine runs on what DeWalt calls Efficient High Pressure (EHP) technology which will make the motor and the rest of the machine last longer. It is an air powered machine that is quite reliable. The DeWalt D55146 has a pump which does not require oil. It really requires very little maintenance at all to keep it running smoothly. The Efficient High Pressure technology makes the motor last longer and it also allows the pump to be run with an extension cord when needed, as long as the extension cord is 50 feet or less and is at least a 12 gauge cord. One of the most sought after features on air compressors today is having lower than average noise and the DeWalt D55146 is quieter than many of the compressors in its class with a measurement of 78 decibels. Many other models are rated at 90 decibels. Contractors have commented on how much quieter it is than they expected it to be. 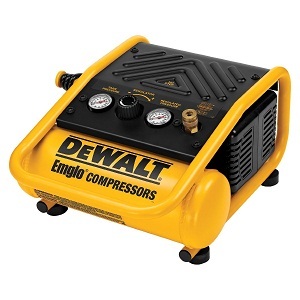 This air compressor is for anyone who needs to do finishing and nailing work. 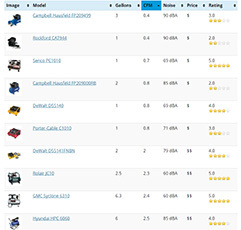 It can be used for other reasons, but it really is designed for contractors who want a reliable and easy-to-move product. 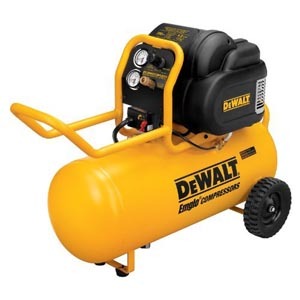 This is also a good model for anyone who has a high tech home shop and needs to have a better than average air compressor for the bigger jobs around the house. At almost 90 pounds, this is not an easy machine to lug around the house for quick jobs. In conclusion, the DeWalt D55146 is a great product at a good price for anyone who needs to do serious nailing and other work with air tools. It is made with reliable and top notch technology that makes it easy for anyone to use. The biggest con is the weight, but with durable machines made of quality materials usually comes heavier weight.